This article is about the 2008 film. For the film franchise, see Cloverfield (franchise). Development began when producer J. J. Abrams started conceptualizing a new monster and enlisted Neville Page to design the creature, referred to as Clover. In February 2007, the project was secretly greenlit by Paramount Pictures and produced by Abrams' Bad Robot Productions. Principal photography took place in Los Angeles that same year. During production, the project went under several working titles, including Slusho, Cheese and Greyshot. As part of a viral marketing campaign, a teaser trailer was released ahead of screenings of Transformers without a title attached. The film's official title was revealed in a second teaser trailer attached to screenings of Beowulf. With limited details revealed about the film prior to release, it garnered online speculation, including forums and websites dedicated to uncovering any hidden information about the film. Several tie-ins, including a prequel manga series, were released as part of the film's marketing campaign. Cloverfield was released on January 18, 2008 and received positive reviews from film critics. Many praised Reeves' direction and the film's cinéma vérité style narrative. It earned $170.8 million worldwide at the box office against a $25 million budget. The film served as the first installment of the Cloverfield franchise, followed by 10 Cloverfield Lane in 2016 and The Cloverfield Paradox in 2018. The film is presented as footage from a personal camcorder recovered by the United States Department of Defense in the area "formerly known as Central Park", bearing a disclaimer stating multiple sightings of a case designated "Cloverfield". The film begins on April 27, 2009, at 6:42 AM, as a video taped by Rob Hawkins with his camcorder, at his girlfriend Beth McIntyre's dad's apartment, where they had spent the night while her dad was out of town. He wakes Beth up and asks her if she's ever been to Coney Island, when Beth says she hasn't, the two make plans to go there that day. The video then unexpectedly cuts to the evening of May 22, 2009. (When the video taped on May 22 was recorded, the tape wasn't changed and the new video was taped over Rob and Beth's Coney Island trip video, with short clips of the video seen throughout the film when the camera has interference.) Rob has a farewell party thrown for him by his brother Jason and Jason's girlfriend Lily Ford, in celebration of Rob's new job in Japan. Their friend, Hud Platt, films testimonials for Rob during the party. Beth brings a new man to the party. By May 23, Rob listens to a phone message from Beth, stating that she is trapped in her apartment at the Time Warner Center and unable to move. Going against the crowd, Rob, Hud, Lily, and another party-goer, Marlena Diamond, venture into Midtown Manhattan to rescue Beth. By 3:17 am, they get caught in a battle between the creature and the Army National Guard and run into the subway, soon attacked by several of the parasitic creatures; during the scuffle, Marlena is bitten by one. The four escape the subway and come to a command center and field hospital. Marlena bleeds from her eyes in reaction to the bite. She is dragged into a tent, where she appears to explode. Rob, intending to save Beth, persuades one of the military leaders to let him go. The man then tells Rob when the last evacuation helicopter will depart before the military executes its "Hammer Down Protocol," which will destroy Manhattan in an attempt to kill the monster. The group find Beth who is non-fatally impaled on the side of the chest on an exposed rebar which they remove. They rescue her and the four make their way to the evacuation site at Grand Central Terminal, where they encounter the creature once more. Lily is rushed into a departing Marine Corps helicopter and escapes. Moments later, Rob, Beth, and Hud are taken away in a second helicopter and witness the creature being bombed. The bombing causes the creature to fall, but it lunges at the group's helicopter, causing it to crash into Central Park. Less than an hour later, a voice on the crashed helicopter's radio warns that the Hammer Down protocol will begin in fifteen minutes. The three friends regain consciousness and flee; Hud retrieves the camera when the creature suddenly appears and kills him. Rob and Beth grab the camera and take shelter under an arch as sirens blare and the bombing starts. Rob and Beth take turns leaving their last testimony of the day's events. The bridge crumbles and the camera gets knocked out of Rob's hand and buried beneath some rubble. Rob and Beth proclaim their love for each other just before another bomb goes off, with both screaming as the monster roars. A final scene shows the ending of Rob and Beth's Coney Island video. In the backdrop, an unknown object crashes into the ocean. After the credits, an unknown voice is heard saying, "Help us." However, when the audio is reversed, it says, "It's still alive." In February 2007, Paramount Pictures secretly greenlit Cloverfield, to be produced by Abrams, directed by Matt Reeves, and written by Drew Goddard. The project was produced by Abrams' company, Bad Robot Productions. The film was initially titled Cloverfield. This changed several times throughout production before it was decided that the original title would be used. Matt Reeves explained that the title was changed frequently due to the hype caused by the teaser trailer. "That excitement spread to such a degree that we suddenly couldn't use the name anymore. So we started using all these names like Slusho and Cheese. And people always found out what we were doing!" The director said that "Cloverfield" was the government's case designation for the events caused by the monster, comparing the titling to that of the Manhattan Project. "And it's not a project per se. It's the way that this case has been designated. That's why that is on the trailer, and it becomes clearer in the film. It's how they refer to this phenomenon [or] this case", said the director. The film's final title, Cloverfield, is the name of the exit Abrams takes to his Santa Monica office. In turn, the road used to lead to the Santa Monica Airport, which originally bore the name Clover Field. The film received a subtitle in Japan, where it was released as Cloverfield/Hakaisha (クローバーフィールド/HAKAISHA, Kurōbāfīrudo/HAKAISHA). The subtitle "Destroyer" was chosen by Abrams and was translated into Japanese as Hakaisha (破壊者, lit. "Destroyer") by Paramount Japan at his request. The subtitle Kishin (鬼神, lit. "Demon[ic] God") was chosen for the manga spin-off, Cloverfield/Kishin, released exclusively in Japan. The casting process was carried out in secret, with no script being sent out to candidates. To prevent the leaking of plot information, instead of auditioning the actors with scenes from the film, scripts from Abrams' previous productions were used, such as the television series Alias and Lost. Some scenes were also written specifically for the audition process, not intended for use in the film. Despite not being told the premise of the film, Caplan stated that she accepted a role in Cloverfield solely because she was a fan of the Abrams-produced Lost (in which her former Related co-star Kiele Sanchez was a recurring character), and her experience of discovering its true nature initially caused her to state that she would not sign on for a film in the future "without knowing full well what it is". She indicated that her character was a sarcastic outsider, and that her role was "physically demanding". With production estimated to have a budget of $30 million, principal photography began in mid-June 2007 in New York. One cast member said that the film would look like it cost $150 million, despite producers not casting recognizable and expensive actors. Filmmakers used the Panasonic HVX200 for most of the interior scenes, and the Sony CineAlta F23 high-definition video camera to tape nearly all of the New York exterior scenes. Filming took place on Coney Island, with scenes shot at Deno's Wonder Wheel Amusement Park and the B&B Carousel. The scenes of tanks firing at the creature while the main characters hide in a stairwell were filmed on Hennesy Street on Warner Bros. backlot in Burbank, CA. Some interior shots were taped on a soundstage at Downey, California. Bloomingdale's in the movie was actually shot in an emptied Robinsons-May store that was under reconstruction in Arcadia, California. The outside scenes of Sephora and the electronics store were taped in Downtown Los Angeles. Sign at an AMC theater warning customers by comparing the film to a roller coaster. The film's shaky camera style of cinematography, dubbed "La Shakily Queasy-Cam" by Roger Ebert, caused some viewers (particularly in darkened movie theaters) to experience motion sickness, including nausea and a temporary loss of balance. Audience members prone to migraines have cited the film as a trigger. 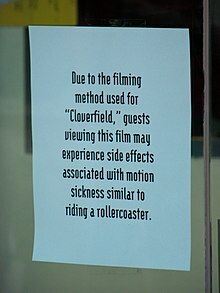 Some theaters showing the film, such as AMC Theatres, provided poster and verbal warnings, informing viewers about the filming style of Cloverfield, while other theatres like Pacific Theatres just verbally warned customers in detail at the box office about experiencing motion sickness upon viewing the film and what to do if they had to step out and vomit. All of the major characters received a personal Myspace page, all of which are accessible and featuring available photos, though blog posts have been removed. The drink Slusho! served as part of the viral marketing campaign. The drink had already appeared in producer Abrams' previous creation, the TV series Alias. Websites for Slusho! and Taguruato were launched to add to the mythology of Cloverfield. The Japanese phone number in the Tagruato website did work, but only played recorded messages. For example, one of the messages was: "Thank you for calling Tagruato. Due to high call volumes, your call has been transferred to an automated answering service. There are no updates at this time. After the tone, please leave a message, and one of our associates will find you as soon as possible". A building bearing the company logo for Tagruato can also be seen in the TV spot[clarification needed] of the 2009 Star Trek film, and Uhura orders a Slusho! during the bar scene. When Cloverfield was hosted at Comic-Con 2007, gray Slusho! T-shirts were distributed to attendees. Fans who had registered at the Slusho! website received e-mails of fictional sonar images before the film's release that showed a deep-sea creature heading toward Manhattan. Fans who ordered merchandise received pieces of torn Tagruato documents and Japanese newspapers along with their products. A cup of Slusho! appears briefly in The Cloverfield Paradox, and it has also appeared in Fringe and Heroes. A Slusho! bobblehead figure also appears shaking in The Cloverfield Paradox trailer and film. A four-installment prequel manga series by Yoshiki Togawa titled Cloverfield/Kishin (クローバーフィールド/KISHIN, Kurōbāfīrudo/KISHIN) was released by Japanese publisher Kadokawa Shoten. The story focuses on a Japanese high school student named Kishin Aiba, who somehow bears a connection to the monster. Due to its presentation as footage from a consumer digital recorder, Cloverfield has no film score, with the exception of the composition "Roar! (Cloverfield Overture)" by Michael Giacchino that plays over the end credits. Similarities between "Roar!" and the music of Godzilla composer Akira Ifukube have been noted, and it has been suggested that Giacchino's overture is a tribute to Ifukube's work, which was confirmed by Matt Reeves in the DVD's commentary track. The sound track was supervised by William Files and Douglas Murray at Skywalker Sound. Rob's Party Mix or Cloverfield Mix is a collection of the music played in the opening party sequences of the film that was released exclusively on Apple's iTunes Store on January 22, 2008 in lieu of a traditional soundtrack album. The Cloverfield score, "Roar! (Cloverfield Overture)" by Michael Giacchino that plays over the end credits is not featured on the album, as it is the mixtape played at the party and is not the official soundtrack of the film. This album was distributed to guests at a Cloverfield premiere party held at the Dark Room in New York City on January 17, 2008. A complete soundtrack release of all the music in the film, including Giacchino's "Roar!" end title piece, has now also been released exclusively on iTunes; it has not been officially released in retail stores. A CD entitled Rob's Party Mix comes packaged in a special edition of Cloverfield made available for sale in Canadian Wal-Mart stores beginning on April 22, 2008. First publicized in a teaser trailer in screenings of Transformers, the film was released on January 17 in New Zealand, Russia and Australia; January 18 in North America; January 24 in South Korea; January 25 in Taiwan; January 31 in Germany; and February 1 in the United Kingdom, Ireland and Italy. In Japan, the film was released on April 5. 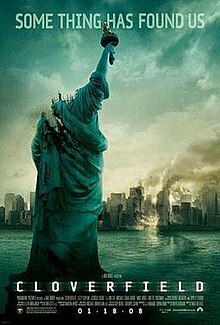 Cloverfield opened in 3,411 theaters on January 18, 2008, and grossed a total of $16,930,000 on its opening day in the United States and Canada. It made $40.1 million on its opening weekend, which at the time was the most successful January release (record then taken by Ride Along in 2014 with a weekend gross of $41.5 million). Worldwide, it has grossed $170,602,318, making it the first movie in 2008 to gross over $100 million. In Japan, the film held the top spot in the box office rankings until the release of Kamen Rider Den-O & Kiva: Climax Deka took the top spot in its first weekend. Critical reception to Cloverfield was generally positive. On the review aggregate website Rotten Tomatoes, the film holds a 77% approval rating based on 204 reviews, with an average rating of 6.8/10. The website's critical consensus reads, "A sort of Blair Witch Project crossed with Godzilla, Cloverfield is economically paced, stylistically clever, and filled with scares". According to Metacritic, the film has received an average score of 64, based on 37 reviews. Marc Savlov of The Austin Chronicle called the film "the most intense and original creature feature I've seen in my adult moviegoing life [...] a pure-blood, grade A, exhilarating monster movie." He cites Matt Reeves' direction, the "whip-smart, stylistically invisible" script and the "nearly subconscious evocation of our current paranoid, terror-phobic times" as the keys to the film's success, saying that telling the story through the lens of one character's camera "works fantastically well". Michael Rechtshaffen of The Hollywood Reporter called it "chillingly effective", generally praising the effects and the film's "claustrophobic intensity". He said that though the characters "aren't particularly interesting or developed", there was "something refreshing about a monster movie that isn't filled with the usual suspects". Lisa Schwarzbaum of Entertainment Weekly said that the film was "surreptitiously subversive, [a] stylistically clever little gem", and that while the characters were "vapid, twenty-something nincompoops" and the acting "appropriately unmemorable", the decision to tell the story through amateur footage was "brilliant". Roger Ebert in the Chicago Sun-Times wrote that the film is "pretty scary at times" and cites "unmistakable evocations of 9/11". He concludes that "all in all, it is an effective film, deploying its special effects well and never breaking the illusion that it is all happening as we see it". Todd McCarthy of Variety called the film an "old-fashioned monster movie dressed up in trendy new threads", praising the special effects, "nihilistic attitude" and "post-9/11 anxiety overlay", but said, "In the end, [it's] not much different from all the marauding creature features that have come before it". Scott Foundas of LA Weekly was critical of the film's use of scenes reminiscent of the September 11 attacks in New York City and called it "cheap and opportunistic". He suggested that the film was engaging in "stealth" attempts at social commentary and compared this unfavorably to the films of Don Siegel, George A. Romero and Steven Spielberg, saying, "Where those filmmakers all had something meaningful to say about the state of the world and [...] human nature, Abrams doesn't have much to say about anything". Manohla Dargis in the New York Times called the allusions "tacky", saying, "[The images] may make you think of the attack, and you may curse the filmmakers for their vulgarity, insensitivity or lack of imagination", but that "the film is too dumb to offend anything except your intelligence". She concludes that the film "works as a showcase for impressively realistic-looking special effects, a realism that fails to extend to the scurrying humans whose fates are meant to invoke pity and fear but instead inspire yawns and contempt." Stephanie Zacharek of Salon.com calls the film "badly constructed, humorless and emotionally sadistic", and sums up by saying that the film "takes the trauma of 9/11 and turns it into just another random spectacle at which to point and shoot". Michael Phillips of the Chicago Tribune warned that the viewer may feel "queasy" at the references to September 11, but that "other sequences [...] carry a real jolt" and that such tactics were "crude, but undeniably gripping". He called the film "dumb", but "quick and dirty and effectively brusque", concluding that despite it being "a harsher, more demographically calculating brand of fun", he enjoyed the film. Bruce Paterson of Cinephilia described the film as "a successful experiment in style but not necessarily a successful story for those who want dramatic closure". Some critics also pointed out the similarity to the Half-Life video game series, in particular the "Ant-lion" monsters from Half-Life 2, and the constant first-person perspective. Empire magazine named it the fifth best film of 2008. The French film journal Cahiers du Cinéma named the film as the third best of 2008. Bloody Disgusting ranked the film number twenty in their list of the "Top 20 Horror Films of the Decade", with the article calling the film "A brilliant conceit, to be sure, backed by a genius early marketing campaign that followed the less-is-more philosophy to tantalizing effect... much like Blair Witch nearly ten years earlier, Cloverfield helped prove, particularly in its first half hour, that what you don't see can be the scariest thing of all." While we were on set making the film we talked about the possibilities and directions of how a sequel can go. The fun of this movie was that it might not have been the only movie being made that night, there might be another movie! In today's day and age of people filming their lives on their camera phones and Handycams, uploading it to YouTube... That was kind of exciting thinking about that. 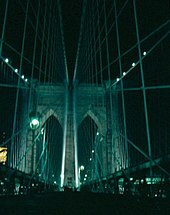 There's a moment on the Brooklyn Bridge, and there was a guy filming something on the side of the bridge, and Hud sees him filming and he turns over and he sees the ship that's been capsized and sees the headless Statue of Liberty, and then he turns back and this guy's briefly filming him. In my mind that was two movies intersecting for a brief moment, and I thought there was something interesting in the idea that this incident happened and there are so many different points of view, and there are several different movies at least happening that evening and we just saw one piece of another. Reeves also pointed out that the final scene on Coney Island shows something falling into the ocean in the background without an explanation. This may have been either the satellite owned by the fictional Japanese media company, Tagruato, or the creature itself. A company news piece on the Tagruato website mentions that a piece of the Japanese Government's ChimpanzII satellite fell off into the Atlantic. Producers Bryan Burk and J. J. Abrams also revealed their thoughts on possible sequels to Entertainment Weekly. According to Burk, "The creative team has fleshed out an entire backstory which, if we're lucky, we might get to explore in future films". Abrams stated that he does not want to rush into the development of the sequel merely because the first film has been a success; he explained that he would rather create a sequel that is true to the previous film. The idea of doing something so differently is exhilarating. We hope that it created a movie experience that is different. The thing about doing a sequel is that I think we all really feel protective of that experience. The key here will be if we can find something that is compelling enough and that is different enough for us to do, then it will probably be worth doing. Obviously it also depends on how Cloverfield does worldwide and all of those things too, but really, for us creatively, we just want to find something that would be another challenge. In September 2008, when asked by CraveOnline what the current status is on Cloverfield 2, Abrams stated that at this point, they were still discussing it; however, he still feels reluctant to work on a sequel. In the same interview, Abrams said that they were working on something that "could be kind of cool." When asked if it would take place in a different location, Abrams replied by saying that "it would be a totally different kind of thing but it's too early to talk about." In a 2010 interview with Attack of the Show!, Abrams stated that they might abandon the filming style, stating that he and the rest of the crew would like to try something new. The film Super 8 was initially speculated to be either a sequel or prequel to Cloverfield, but this was quickly denied by Abrams. Getting the right idea together has been taking a long time. ... You are going to see it – we just don't know when [laughs] ... At the moment we are talking about the story quite a lot. Drew Goddard, who wrote the original, is going to pen the sequel and JJ Abrams is very much involved. ... However, the three of us have been so busy that getting the right idea together has been taking a long time. When asked if the sequel will be shot in real time, Reeves stated, "You see, that's a difficult part: we want it to be shot like the first but how can you continue that idea successfully for a second time? ... We have a lot of affection for the original and the sequel can't just be the same thing. But that is tricky when you need to have a monster destroying stuff once again." On January 14, 2016, 10 Cloverfield Lane was revealed by Bad Robot Productions, with Abrams as a producer and Reeves and Goddard credited as executive producers. The film is described as "a blood relative" but not "a literal sequel" to Cloverfield by Abrams, who produces the film. The film was released on March 11, 2016 and it marks the theatrical feature film directorial debut of Dan Trachtenberg. During an interview with Abrams to promote 10 Cloverfield Lane, he said the creative team behind the original had some ideas on developing Cloverfield 2, but the release of movies such as Godzilla and Pacific Rim led them to abandon them as they found the concept of kaiju movies had played out. However, Abrams also suggested that he has thought of something that if they are lucky enough to get it made "could be really cool that [it] connects some stories" in a future film, even teasing a larger Cloverfield universe. Interviews with Dan Trachtenberg and Mary Elizabeth Winstead, director and actress of 10 Cloverfield Lane, respectively, confirm that the movie is, and always was intended to be, an expansion of the first film, with Trachtenberg calling it the "Cloververse". In October 2016, it was reported that an Abrams-produced project, tentatively titled God Particle, would be the next film set in the Cloverfield universe. The sequel was originally announced as a February 2017 release but has since seen its release date pushed back, most recently to a tentative April 2018 date, with the God Particle title having been dropped and the film now being referred to as Untitled Cloverfield Sequel. It has also been suggested that the original plot device of a god particle may have been completely removed from the script. On February 4, 2018, during Super Bowl LII, a TV commercial aired announcing the film would be entitled The Cloverfield Paradox and would have a surprise release on Netflix after the game. In an April 2018 conference at CinemaCon, Abrams stated that "we're actually developing a true, dedicated Cloverfield sequel." He also said that the sequel would be released theatrically, a departure from the previous installment, The Cloverfield Paradox, which was only released on Netflix. Abrams went on to say that the Cloverfield sequel is coming "very soon." ^ The creatures are called HSP or "Human-Scale Parasites" in the Blu-ray's Special Investigation Mode. ^ "CLOVERFIELD (15)". British Board of Film Classification. January 4, 2008. Retrieved June 29, 2013. ^ a b "Weekend Box Office". Box Office Mojo. Retrieved February 26, 2008. ^ "'God Particle' Is the Next Film in the 'Cloverfield' Universe". Collider. ^ Kelly, Kevin. "io9 Talks To Cloverfield Director Matt Reeves". io9. Retrieved August 3, 2017. ^ Alex Billington (July 26, 2007). "Comic-Con Live: Paramount Panel - Star Trek, Indiana Jones IV, and More..." First Showing. Retrieved September 17, 2007. ^ a b "JJ Abrams talks Cloverfield". Movies Online. Archived from the original on February 18, 2008. Retrieved March 8, 2008. ^ a b c Borys Kit; Tatiana Siegel (July 6, 2007). "Paramount rolls in the Cloverfield". The Hollywood Reporter. Archived from the original on July 8, 2007. Retrieved July 6, 2007. ^ Scott Collura (December 14, 2007). "Exclusive: Cloverfield Director Speaks! Part Two". IGN. Retrieved December 22, 2007. ^ a b Peter Sciretta (September 5, 2007). "What will Cloverfield/1-18-08 Be Titled?". SlashFilm. Archived from the original on September 9, 2012. Retrieved September 5, 2007. ^ Scott Collura (December 14, 2007). "Exclusive: Cloverfield Director Speaks!". IGN. Retrieved December 22, 2007. ^ Bruce Newman (January 18, 2008). "Cloverfield: A monster for the MySpace generation". San Jose Mercury News. Retrieved January 18, 2008. ^ a b c d Cloverfield-(Commentary by director Matt Reeves) (DVD). Paramount Pictures. 2008. ^ "全米大ヒット！「クローバーフィールド／HAKAISHA」に続編の噂!?" [American Blockbuster! Cloverfield/Hakaisha Sequel Rumors!?]. Eiga.com. January 23, 2008. Retrieved May 17, 2010. ^ a b "Lizzy Caplan: The Meanest Girl in Hollywood?". BlackBook Magazine. November 15, 2007. Retrieved November 16, 2007. ^ "Sony's F23 high-definition camera cuts its teeth in the making of "Cloverfield"". Sony Electronics. January 21, 2008. Retrieved January 22, 2008. ^ Farrah Weinstein (July 16, 2007). "Bait Balls of Fire". New York Post. Retrieved July 17, 2007. ^ Lisa Blake (August 22, 2007). "Bases harnessed for double duty". Variety. Retrieved August 27, 2007. ^ a b Manohla Dargis (January 18, 2008). "We're All Gonna Die! Grab Your Video Camera!". The New York Times. Retrieved January 18, 2008. ^ "Cloverfield TJ Miller Interview". YouTube. Retrieved June 11, 2009. ^ a b Ryan Rotten (December 14, 2007). "EXCL: Cloverfield Director Speaks!". Shock Till You Drop. Retrieved December 22, 2007. ^ "Hit Horror Flick Leaving Local Moviegoers Queasy". Koco.com. Oklahoma City News. January 22, 2008. Retrieved June 11, 2009. ^ Ryan Ball (September 27, 2007). "Tippett Making Abrams' Monster". Animation Magazine. Retrieved December 6, 2007. ^ Ryan Rotten (January 2, 2008). "EXCL: Michael Stahl-David Talks Cloverfield Experience". Shock Till You Drop. Archived from the original on January 5, 2008. Retrieved January 8, 2008. ^ BOTF (March 12, 2008). "Tagruato Interview: Cloverfield Lead Creature Designer Neville Page". Retrieved March 13, 2008. ^ a b c d Max Evry (January 21, 2008). "Reeves Runs Merrily Through Cloverfield". Coming Soon. Retrieved January 21, 2008. ^ a b c Tara DiLullo Bennett (December 17, 2007). "Producer Talks Cloverfield". Sci Fi Wire. Archived from the original on December 20, 2007. Retrieved December 22, 2007. ^ Olly Richards (November 19, 2007). "Exclusive: The New Cloverfield Trailer". Empire. Retrieved November 19, 2007. ^ Waxman, Sharon (August 21, 2006). "After Hype Online, "Snakes on a Plane" Is Letdown at Box Office". The New York Times. Retrieved May 11, 2009. ^ Lisa Rose (July 9, 2007). "Hush-hush project stirs wild speculation". The Star Ledger. Retrieved July 9, 2007. ^ a b "Trailer for Abrams film lost on moviegoers". The Guardian. July 11, 2007. Retrieved July 26, 2007. ^ Wolfson, Julie (January 9, 2008). "LAist Interview: Matt Reeves, Director of Cloverfield". Laist.com. Archived from the original on October 1, 2011. Retrieved August 21, 2010. ^ "It's Alive: 1-18-08". IGN. July 5, 2007. Retrieved July 10, 2007. ^ Chris Tilly (July 11, 2007). "What is Cloverfield?". Time Out. Retrieved July 26, 2007. ^ Greg Morago (August 22, 2007). "Our summer of mystery ads". Daily Press. ^ "Was Monstrous Supposed To Be The Title?". Cloverfieldnews.com. September 5, 2007. Retrieved February 3, 2012. ^ Chaping Young (January 17, 2008). "Cloverfield's Fake MySpace Pages". Current. Archived from the original on January 21, 2008. Retrieved January 17, 2008. ^ Omar L. Gallaga (August 3, 2007). "To market a movie, no name is needed; just create mystery and some Web buzz". Austin American-Statesman. ^ Anthony Breznican (July 9, 2007). "Mystifying trailer transforms marketing". USA Today. Retrieved July 16, 2007. ^ Harry Knowles (July 9, 2007). "JJ Abrams drops Harry a Line on all this 1-18-08 stuff!". Ain't It Cool News. Retrieved July 9, 2007. ^ afrench14 (September 14, 2010). "Research into viral marketing". SlideShare. SlideShare Inc. Retrieved August 26, 2012. ^ "Movie codenamed Cloverfield next blockbuster". Courier Mail. News Queensland. August 11, 2007. Retrieved August 26, 2012. ^ a b Silas Lesnick (December 14, 2007). "IESB Exclusive Interview: Cloverfield Director Matt Reeves!". IESB. Archived from the original on December 17, 2007. Retrieved December 22, 2007. ^ Larry Carroll (July 27, 2007). "Comic-Con: J.J. Abrams' Secret Project And The Dark Knight Go Guerrilla With Marketing Tactics". MTV. Retrieved December 22, 2007. ^ Will Pavia (January 2, 2008). "The cloak-and-dagger approach to hype". The Australian. ^ Kadokawa Shoten (January 19, 2008). "Kadokawa Shoten Official Website" (in Japanese). Kadokawa Shoten. Retrieved January 19, 2008. ^ "Shonen Ace Posts Cloverfield Movie Tie-In Manga Online". Anime News Network. January 16, 2008. Retrieved January 19, 2008. ^ "Hasbro toys with Cloverfield monster". Project Cloverfield. March 6, 2008. Retrieved March 6, 2008. ^ Marc Graser (January 21, 2008). "Hasbro toys with Cloverfield monster". Variety. Retrieved January 22, 2008. ^ "Cloverfield review". Syracuse New Times. January 2008. Retrieved June 11, 2009. ^ "ScoreKeeper Has News About The Release Of Michael Giacchino's CLOVERFIELD Overture!!". Ain't it Cool News. March 2008. Retrieved June 11, 2009. ^ "Will Files". IMDb. Retrieved June 11, 2009. ^ "Douglas Murray (III)". IMDb. Retrieved June 11, 2009. ^ a b Michael Phillips (January 16, 2008). "Movie review: Cloverfield". Chicago Tribune. Archived from the original on January 20, 2008. Retrieved January 22, 2008. ^ "The "Rob's" Party Sweepstakes Official Rules". Paramount Pictures Corporation. January 7, 2008. Retrieved January 23, 2008. ^ Cloverfield Special Features – Alternative Endings (DVD). Paramount Pictures. April 2008. ^ "Blu-ray Disc Release Dates | High Def Digest". Retrieved June 11, 2009. ^ "Top Opening Weekends by Month—January". Box Office Mojo. 2014. Retrieved January 3, 2014. ^ "映画興行成績：「仮面ライダー電王」女性人気で堂々1位 「クローバーフィールド」は2位に 4月12、13日". Archived from the original on April 21, 2008. Retrieved April 16, 2008. ^ "Cloverfield (2007)". Rotten Tomatoes. Fandango Media. Retrieved June 21, 2018. ^ "Cloverfield Reviews". Metacritic. CBS Interactive. Retrieved June 21, 2018. ^ Marc Savlov (January 18, 2008). "Cloverfield". The Austin Chronicle. Retrieved January 18, 2008. ^ Michael Rechtshaffen (January 17, 2008). "Bottom Line: It's "The Blair Godzilla Project" - and that's a compliment". The Hollywood Reporter. Archived from the original on December 16, 2008. Retrieved January 17, 2008. ^ Lisa Schwarzbaum (January 16, 2008). "Movie Review: Cloverfield". Entertainment Weekly. Retrieved January 17, 2008. ^ Roger Ebert (January 17, 2008). "Review: Cloverfield". Chicago Sun-Times. Retrieved January 18, 2008. ^ Todd McCarthy (January 16, 2008). "Cloverfield review". Variety. Retrieved January 17, 2008. ^ Scott Foundas (January 16, 2008). "Cloverfield Is a Horror". LA Weekly. Archived from the original on January 18, 2008. Retrieved January 17, 2008. ^ Stephanie Zacharek (January 17, 2008). "Cloverfield: Do we really need the horror of 9/11 to be repackaged and presented to us as an amusement-park ride?". Salon.com. Retrieved January 18, 2008. ^ "Cloverfield is Half-Life". The Guardian. February 14, 2008. Retrieved March 23, 2013. ^ "Metacritic: 2008 Film Critic Top Ten Lists". Metacritic. Archived from the original on January 2, 2009. Retrieved January 11, 2009. ^ "Cahiers du Cinema: Top Ten Lists 1951-2009". Alumnus.caltech.edu. Retrieved August 21, 2010. ^ "00's Retrospect: Bloody Disgusting's Top 20 Films of the Decade...Part 4". Bloody Disgusting. Retrieved January 3, 2010. ^ Sciretta, Peter (June 25, 2008). "2008 Saturn Awards Winners – /Film". /Film. Retrieved March 1, 2018. ^ "Golden Schmoes Winners and Nominees (2008) | JoBlo.com Movie Network". JoBlo.com. Retrieved March 1, 2018. ^ "GTA9 Nominees (2008) - Nominees Categories | Golden Trailer Awards". Golden Trailer Awards. Retrieved March 1, 2018. ^ "2008 IFCS Awards - Internet Film Critics". www.internetfilmcritics.com. Retrieved March 1, 2018. ^ "Le nomination IOMA 2008 - CinemaItaliano.info". CinemaItaliano.info (in Italian). Retrieved March 1, 2018. ^ Seijas, Casey. "Comics Take Over '2008 Scream Awards' As Nominees Announced". MTV News. Retrieved March 1, 2018. ^ "2008 Teen Choice Awards winners and nominees". Los Angeles Times. Arthur Ochs Sulzberger, Jr. June 17, 2008. Archived from the original on September 12, 2008. Retrieved March 1, 2008. ^ "ASCAP HONORS TOP FILM AND TELEVISION MUSICCOMPOSERS AND SONGWRITERS AT 24TH ANNUAL AWARDS CELEBRATION". American Society of Composers, Authors and Publishers. Retrieved March 1, 2018. ^ "2009 IFMCA Awards". International Film Music Critics Association. November 25, 2010. Retrieved March 1, 2018. ^ "The 2009 FANGORIA Chainsaw Awards Results". GoreMaster News. June 26, 2009. Retrieved March 1, 2018. ^ "2009 GOLDDERBY FILM AWARDS". GoldDerby. March 7, 2016. Retrieved March 1, 2018. ^ Kilday, Gregg. "'Button' among Golden Reel nominees". The Hollywood Reporter. Retrieved March 1, 2018. ^ "7th Annual International Online Cinema Awards – Awards Daily". AwardsDaily. Retrieved March 1, 2018. ^ "7th Annual VES Awards". 7th Annual VES Awards. Retrieved December 21, 2017. ^ SpookyDan (January 19, 2008). "Cloverfield Sequel News". Fearnet. Retrieved January 19, 2008. ^ SpookyDan (January 17, 2008). "Cloverfield Sequel Talk, Violent Plans!". Bloody Disgusting. Archived from the original on March 8, 2012. Retrieved January 17, 2008. ^ SpookyDan (January 27, 2008). "Cloverfield Monster Has History, More Sequel Talk!". Entertainment Weekly. Archived from the original on February 18, 2014. Retrieved January 27, 2008. ^ Orlando Parfitt (February 1, 2008). "Matt Reeves Clarifies Cloverfield Sequel Status". Rotten Tomatoes. Archived from the original on April 16, 2008. Retrieved February 1, 2008. ^ Gossip, Latin (September 11, 2008). "J.J Abrams is on the Fringe". CraveOnline.com. Archived from the original on February 25, 2011. Retrieved December 13, 2009. ^ Moody, Mike (January 15, 2010). "J.J. Abrams talks 'Cloverfield' sequel". digitalSpy.com. Retrieved January 18, 2010. ^ "J.J. Abrams Talks Cloverfield Sequel". Dreadcentral.com. January 19, 2010. Retrieved August 21, 2010. ^ "We've Got Details on J.J. Abrams's Secret Movie Trailer for Super 8". New York. May 4, 2010. ^ Jada Yuan (May 5, 2010). "J.J. Abrams's Cloverfield-esque Super 8 Has 'Nothing Whatsoever to Do With Cloverfield'". Vulture. New York Media LLC. Retrieved August 26, 2012. ^ Chris Eggertsen. "Matt Reeves 'Cloverfield 2' Update: It May Never Happen". Bloody Disgusting. Retrieved March 9, 2011. ^ "Matt Reeves talks Cloverfield 2". Total film. March 15, 2011. Retrieved August 11, 2011. ^ ShockTillYouDrop.com (March 7, 2012). "A Cloverfield 2 Update From Drew Goddard". Comingsoon.net. Retrieved August 26, 2012. ^ Angie Han (April 17, 2012). "Sequel Bits: James Cameron Wants More T-800 in Terminator 5, Plus: Mission: Impossible 5, Cloverfield 2, Grown-Ups 2, Star Trek Video Game". / Film. /FILM. Retrieved August 26, 2012. ^ Thrower, Emma (March 16, 2016). "Exclusive: J.J. Abrams talks 10 Cloverfield Lane". Empire. Retrieved January 11, 2018. ^ a b Davis, Erik (February 24, 2016). "Exclusive: J.J. Abrams Talks '10 Cloverfield Lane' and Its Connection to the Larger 'Cloverfield' Universe". Fandango. Retrieved January 11, 2018. ^ Chitwood, Adam (January 14, 2016). "10 Cloverfield Lane Is J.J. Abrams' Secret Bad Robot Movie". Collider. Retrieved January 11, 2018. ^ Sullivan, Kevin P. (February 25, 2016). "Cloverfield: J.J. Abrams already knows what the third movie would be". Entertainment Weekly. Retrieved January 11, 2018. ^ Evry, Max (March 10, 2016). "Mary Elizabeth Winstead and the 10 Cloverfield Lane Director". comingsoon.net. Retrieved January 11, 2018. ^ Donnelly, Matt (October 26, 2016). "JJ Abrams' 'God Particle' Is Next Film in Cloverfield Series (Exclusive)". TheWrap. Retrieved January 11, 2018. ^ Davidson, Matt (January 3, 2018). "Cloverfield 3 Delayed Again, May Have New Title". IGN. Retrieved January 11, 2018. ^ "J.J. Abrams Says Another 'Cloverfield' Movie Is Happening". Complex. Retrieved April 26, 2018. ^ "J.J. Abrams Promises A Sequel To 'Cloverfield' Is Coming To Theaters". UPROXX. April 26, 2018. Retrieved April 26, 2018. ^ "Paramount Confirms True Cloverfield Sequel In The Works". Screen Rant. April 25, 2018. Retrieved April 26, 2018. Wikimedia Commons has media related to Cloverfield.